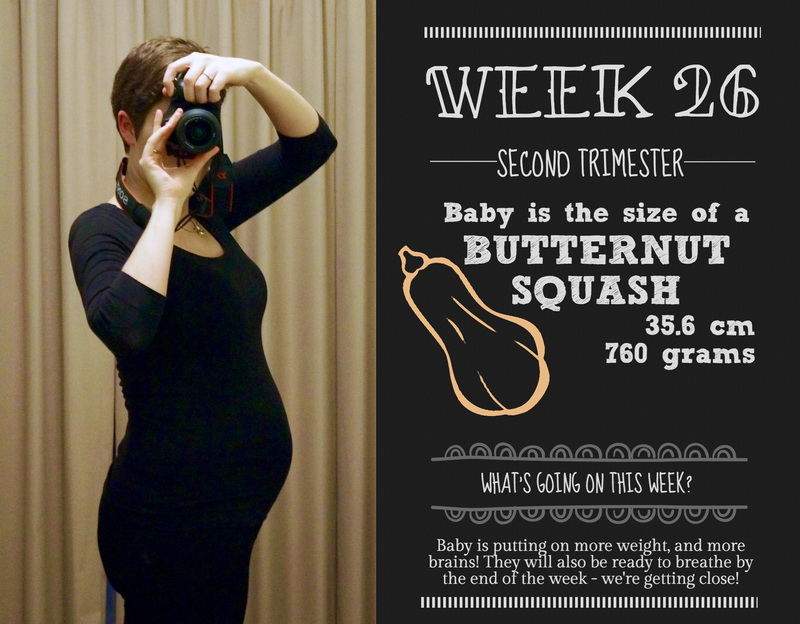 Baby: Once again, we have some conflicting info on vegetable sizes this week – one app says a coconut (at 35cm?? ), one says a papaya (we’ve done that!) so I’m going with a butternut squash, or pumpkin if you prefer. My little pumpkin, awwww. What I’m cooking: By the end of the week, Grub’s lungs will be mature enough to breathe air, which is very exciting – yet another milestone towards her being ok if I happen to go into labour early. Main symptom: Rib pain – ouch, how my ribs ache! I’ve progressed from a popping feeling when I sit up, to consistent tenderness at the bottom of my ribs, to last night where I’m pretty sure I’ve pulled a muscle somewhere under a rib, which means I can’t take a deep breath. Way to prepare for the third trimester! What’s on this week: No appointments as such, but after being knocked over by the cold last week, this week I really, really want to get back to yoga! This week has been a bit of a return to normality – I was back at work on Monday, and I’ve managed to last the whole week! Amazing! But I’m pretty exhausted. I’m still recovering from last week’s bug, but the coughing is slowly subsiding, and the congestion is clearing up nicely. Today was the first day I’ve felt energetic at all, which I think has been helped quite a bit by the gorgeous weather we’ve had. Suddenly today feels like the start of Spring – blue skies, warm breeze, blossoms starting to pop on the trees. It’s funny how much just a blue sky makes me feel happier – like I’m waking up from winter’s hibernation. It’s an exciting feeling, I’m really looking forward to Miss Grub being able to experience her first Spring and Summer! I’ve also been shopping up a storm this week – I think it’s the knowledge that we’re nearly in the home stretch that has spurred on a bit of a preparation frenzy. As you know if you’ve read this post, I’m planning on using cloth nappies, when Miss Grub starts fitting into them. I’ve decided I’m not going to give myself a hard time about using them as a newborn – I’ll wean her into them depending on when they fit. I managed to score a bulk set of lightly used BumGenius Freetime nappies earlier this year, which have looked the best in terms of reviews and ease-of-use so far. I’ve added to that with 6 Baby Bare ones (check them out, they’re ridiculously cute and fluffy!) – these have the absorbency bit as a snap-in, which is a little more time consuming, but from what I’ve read it’s very useful at night, when you might need an added few layers so there’s no leaks. So now I have a stash of 20 one-size nappies, which I’ll add to down the track if I feel the need. This should mean I have enough to only wash every second day, depending on Miss Grub’s toilet habits! On top of this, I’ve bought 4 “boosters” for night wear (you add these into the nappy as an extra), which again I’ll try out and add to later if need be. In other purchases, I realised that I have a few events coming up that I need to dress up for, so ASOS has been my friend here! I’ve found that the official pregnancy stores charge ridiculous prices for even the most basic items ($40 for maternity tights! ), and the more budget stores (Kmart, Target etc) are great for basics, but rubbish for anything fancier. So, ASOS. What a saviour! The amount of maternity clothes are ridiculous, and as long as I buy in a generous size (who am I kidding, there’s no way I’m an Aus size 10 anymore! ), they seem to fit well. Cue more money leaving my bank account. I picked up two great looking dresses for under $60 this week, and I’m looking forward to them arriving soon. Lastly, I finally made it back to yoga this week, and it’s been great. I was a little bummed out that I’d missed the birth preparation class a couple of weeks ago, so it’s been great to get back into the breathing, exercising swing of things. This should all help me with techniques for when D-Day hits. This week, for the first time ever I was the most advanced in pregnancy! It’s getting real! 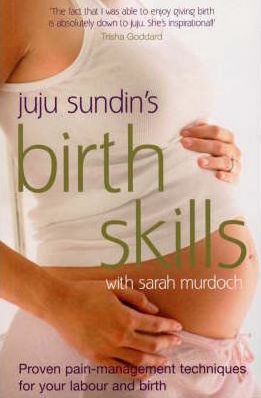 Also, I’ve started reading yet another book as recommended by a friend, called Birth Skills. It has a similar focus as the Calm Birth or hypnobirth classes, but is a little more tolerant of the possible need for pain relief. The book goes through a heap of difference ways of dealing with labour, including movement (active labour), breathing, visualisation exercises, and general coping strategies. It’s been great to read this, as I feel like I’m getting the info that I missed at the birth prep class. This is also the last week of my second trimester – next week I’ll be writing to you from the steep slope that is the third trimester. Again, the combination of excitement and terror is ever-present!